Many new gins on the market strive to be elite and premium, the best in the west. Not this gin. This gin strives to innovate. Brought to life by a small group of insatiable entrepreneurs, Rob Heyns and Nzeka Biyela, founders of League of Beers, and Kelly and Mark Goldsworthy, trained winemaker, brewer and distiller among them, Sugarbird Gin was born on the belief that creativity empowered has the potential to inspire ongoing positive change. What’s in a name, a brand, a label? For everything this gin was to represent, the Sugarbird personified it all. By her very nature, she roams in search of perfect nectar. Her strength, agility and unassuming grace all speak to what the founders of this gin associate as some of the hallmarks to any successful entrepreneurial journey. Easy going, diligent yet free – these things embody this creative process. In rose gold, she is not only delicate and strong but pays homage to the lasting copper stills found in distilleries. The sugarbird is fittingly also an ambassador to the gin’s innate ingredient profile. At her core, she is the embodiment of lush, floral fynbos. Her infusions of rooibos, honeybush and rose geranium are all indigenous to the greater region while the Cape May Flower is sourced by botanists from the slopes of our iconic mountain. 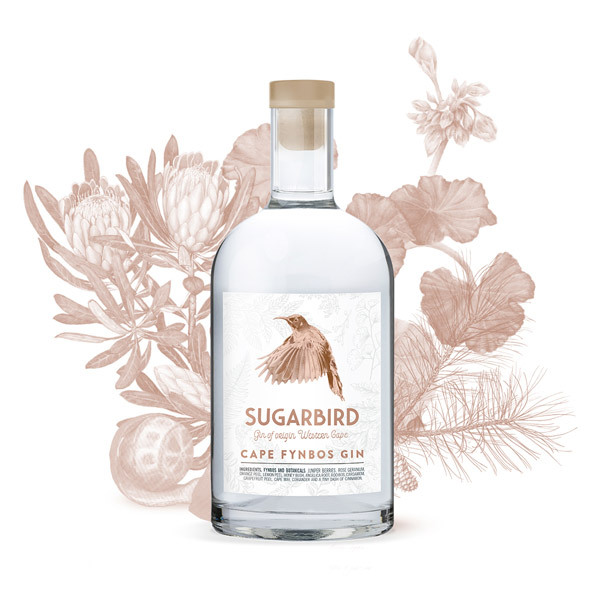 Sugarbird Gin is a true creature of the Cape with hints of cardamom, coriander and the subtle addition of cinnamon echoing roots of the Cape Malay cuisine. Through this proudly South African bouquet of flavours, her makers hope to show the world an iconic and recognisable SA gin achievable through the great, local distillation techniques developed off the wings of our winemaking industry. Like any dream that continues to grow with its creator, Sugarbird Gin is an ever developing product, a constant work in progress. Her makers aspire to remain constantly flitting from one ingredient source to the next, much like their namesake, always subtly refining and developing her flavour profile. And this is precisely the audience she was made for. Not one for soaring at lofty heights, sugarbirds are your hardworking, everyday, garden variety companion. As a reasonably priced spirit, Sugarbird Gin is a simple, friendly spirit able to buoy the humble and hard-working hustlers and inspire the creatives and believers. Her hope is that a great many wild ideas may come to fruition through the enjoyment of her indigenous flavour and good quality, local produce. A drink made by passionate entrepreneurs, to be enjoyed by savvy go-getters aims to close the loop by paying it forward. Sugarbird Gin is all about creativity and empowering this in others. 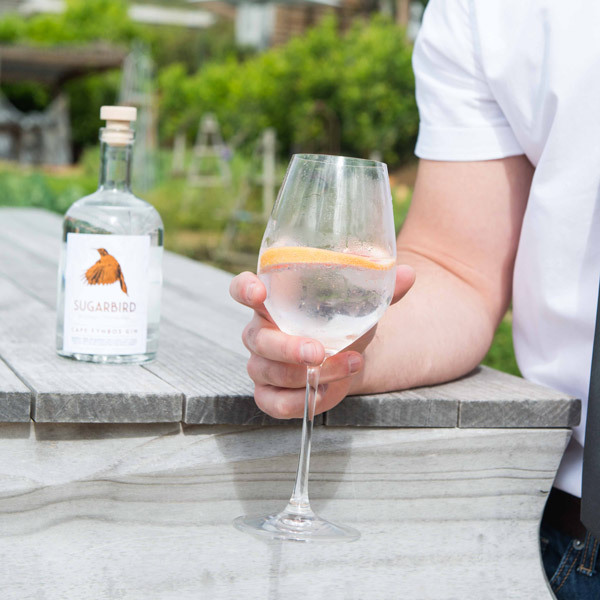 Not only do the makers of this gin aim to support the land her flora grows on, but also the entrepreneurial endeavours of the people who call it home. 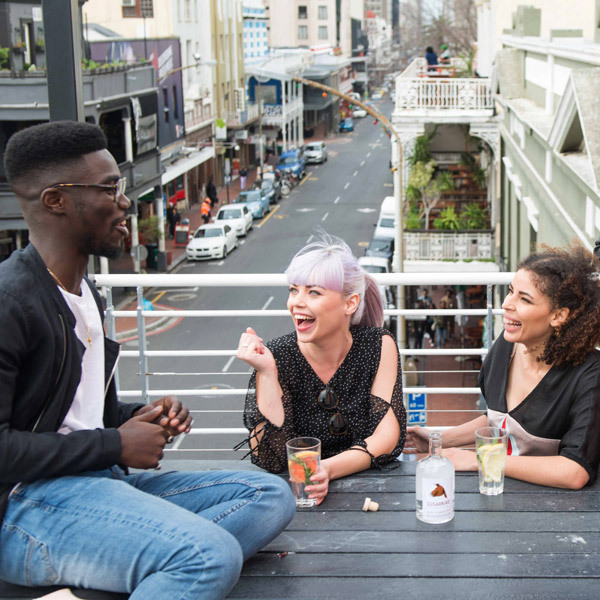 Sugarbird Gin, in collaboration with KOI group, will be using proceeds from every 1,000 bottles to grant bursaries to further aspiring and deserving entrepreneurs in developing their skills and helping to launch their big ideas.